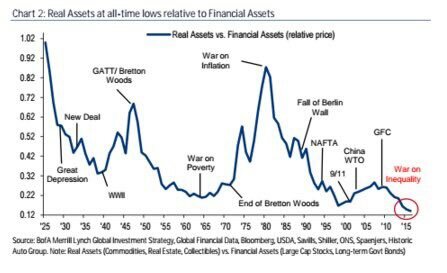 Jesse Felder on Twitter: "Real assets at all-time lows relative to financial assets - via @Macronomics1 https://t.co/ALSoJbPYjh"
Formerly at Bear Stearns then co-founder of multi-billion-dollar hedge fund firm. Now an independent investor and publisher at The Felder Report. You are about to delete this message. This conversation will be deleted and this account cannot message you until you message them again. The conversation will be deleted and you will not be able to participate in this group. How very odd concerning the recent increase of property prices. And collectibles. Just tells you how bad commodities have been. couple that graph with the one of financial wealth to gdp and you have quite the story. No, no... financial assets at all-time high relative to real assets. That´s the point. @J0nathanDavis Good time to buy real assets then? Yes U been saying 4 while but property out, gold volatile, So how best to hold other real assets? From an inverse view: Financial (intangible) assets are at all-time highs relative to real (physical) assets. Jesse, real, "Real Assets" Real Estate, Art, Collectables are flying. Hey! maybe bc we have electronic money & a tech banking system we have other options to cash or hard assets?! Nice chart! In 1970 Gold closed at $38.90 and closed at $1980 in 1980 a 15x return. Silver actually outperformed. sorry typo. Closed at $594 in 1980 my bad. Yes. "Stuff" is cheap. A compelling valuation when an alternative to financial assets is needed.